“Arete is the Aristotelian word which translates into ‘virtue,’ ‘goodness,’ or ‘excellence’ in any field. For Aristotle, Arete had many associations: intellectual, social, as well as defining a person’s moral nature. A more contemporary definition of Arete is the aggregate of qualities that comprise good character. 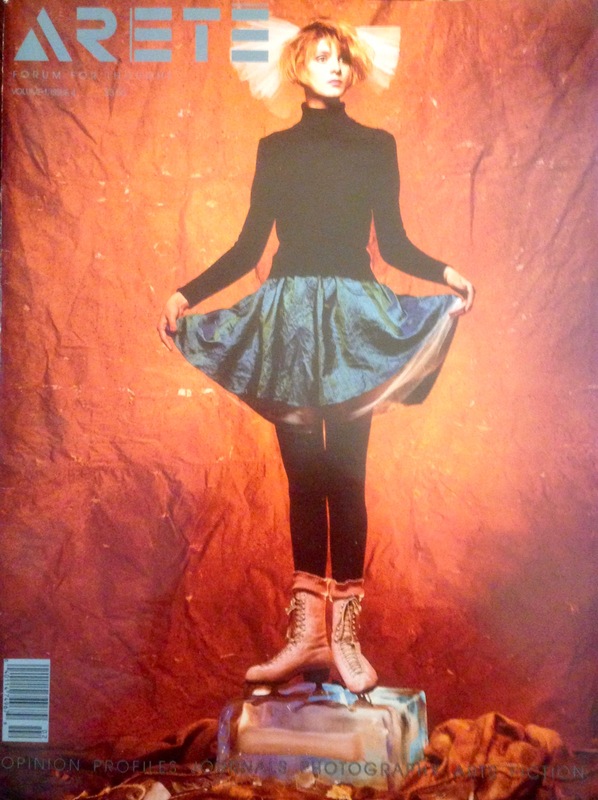 In the context of this magazine, it means a forum for thought and reflection.” So reads the editor’s note inside this, the fourth issue of the short-lived Arete: Forum for Thought. It was a bimonthly West Coast-based magazine that never made it East – or, if it did, it never made it to the magazine racks of the suburban Philly bookstores I frequented. I discovered it, I think, in mid-1988 via Writer’s Digest magazine, which mentioned its need of articles and reviews. I submitted some album reviews; the editor(s) bought a few (at $25 a pop) and printed one in the second issue – my take on Brian Wilson’s 1988 eponymous album. 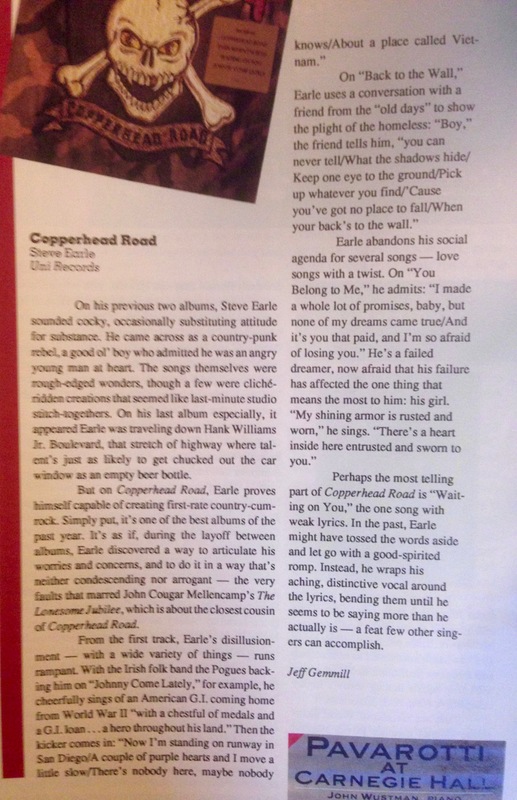 I submitted more; they bought a few and printed one in this, the January/February 1989 issue – my thoughts on Steve Earle’s Copperhead Road. I submitted more; they bought a few and…I don’t know. Free copies stopped arriving in my mailbox, so I have no idea what, if anything, they printed. Anyway, by the time this issue reached me, I was leading a work life led by many a former English major: retail. The year before, I signed on with West Coast Video, which was attempting to expand into the CD market, and managed the CD department at a store in Philly’s Andorra shopping center, across the street from the apartment complex where my grandparents once lived. It was a thankless job in just about every respect, but I did well enough in it that, in early ’89, the division head expanded my responsibilities to include the Bala Cynwyd store. It was in Bala, one Saturday afternoon in late February, that a cute brunette walked in, slammed her purse on the counter and said – no, demanded, “Where the hell are the Nanci Griffith CDs I ordered?” I’m exaggerating, of course, but that was how Diane and I met. 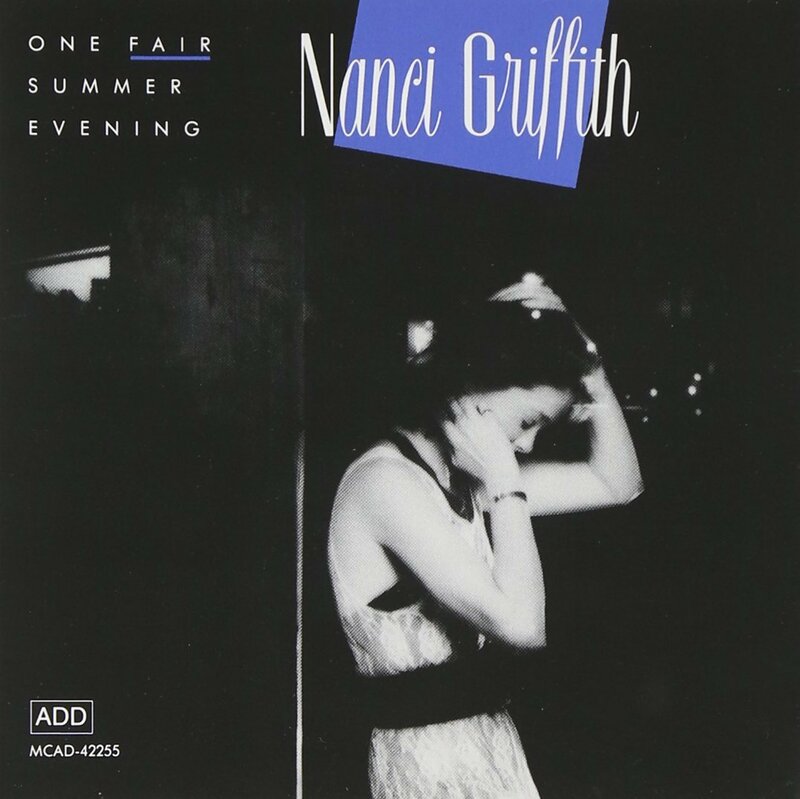 She was impressed that I not only knew who Nanci Griffith was, but was familiar with her music. (I discovered her during my Folk Show days via a Folkways compilation – this one, in fact.) I, in turn, was pleased that she liked the Flying Burrito Brothers, whose new best-of I recommended to her. So, today’s Top 5: January/February 1989 – as in, things I was listening to at the time. 1) Nanci Griffith – “More Than a Whisper.” Nanci, for those unfamiliar with her, is a Texas-bred singer-songwriter who learned her craft in large part – as so many of her generation did – from Townes Van Zandt. The live One Fair Summer Evening, released in late 1988, is a wonderful summary of the first phase of her career; and this song, originally released on her 1986 Last of the True Believers album, was (and remains) one of my favorites by her. 3) R.E.M. – “Orange Crush.” There, in the review next to mine, is Holly Gleason’s perceptive take on Green, R.E.M.’s major-label debut: “No doubt, cries of ‘sell out’ have already begun from those begrudging the band’s ever-growing audience.” I remember those cries well; and, in fact, they’re still there, in some corners of the Internet. Green may not have been R.E.M.’s finest work, but it was damn good. 4) Indigo Girls – “Secure Yourself.” I was, for a time, a huge Indigo Girls fan, and saw them not once, but three times this year – opening for Neil Young in June and twice in August, when they headlined at the TLA on back-to-back nights. The last two were good, if somewhat short, shows – very distinct voices that blended well together, and their occasional lyrical preciousness was disarmed by their sense of humor and smart choices of cover songs. One highlight: Amy played part of Led Zeppelin’s “Stairway to Heaven.” Another: they sang an Elton John song – “Mona Lisa and Mad Hatters,” I believe, but I could be confusing it with another Elton song. But then…I don’t know. It’s kind of what I wrote about Pat Benatar in the last Top 5; I moved on. 5) Ciccone Youth – “Into the Groovey.” Another band I liked for a time: Sonic Youth. They released a few albums that I enjoyed leading up to this twisted side-project, a tribute (or something) to Madonna and the music of the ‘80s.